If you'd like to find the correct replacement watch strap for your watch, please follow the instructions below! 1. Does your watch have standard lug ends? 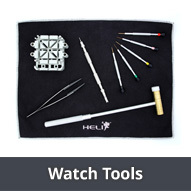 If your watch has standard lug ends, you have the advantage that you don't necessarily have to buy an original replacement strap from the manufacturer of your watch. 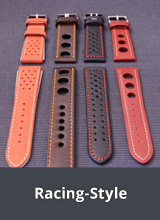 You can choose from the huge range of leather, metal or synthetic watch straps available on our website. 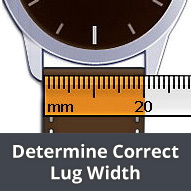 Simply choose the correct lug width (Lug Width Info). 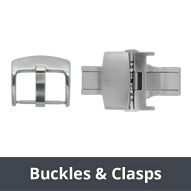 If you would like to use your original buckle or clasp, please ensure you choose a watch strap with the same width of buckle as your buckle or clasp! If you are not able to, or would not like to use a standard watch strap, please find out the reference number of your watch. This can normally be found on the underside of your watch's casing, or in the documentation that came with your watch. 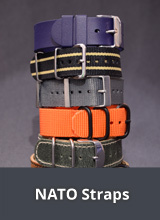 Copy this number into our shop search function to find out if we stock a strap suitable for your watch. Should the search results not contain anything suitable, try a few different variants or a shortened version of the number. 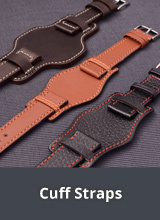 If you've found a suitable watch strap, please check the other characteristics of that strap (material, colour, lug width, length etc.) 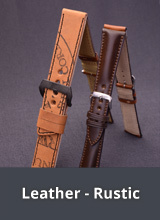 before you buy, to ensure that it really is the correct strap for your watch. 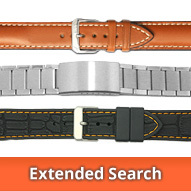 If you haven't found the watch strap you're looking for using our search function, you can also try going to the shop section "WATCH BRANDS". 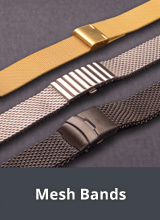 In this shop section you will find all our replacement straps suitable for specific watch brands, sorted by brand. Article numbers for replacement straps from third party manufacturers are often not provided, that is why it is important that you check also check the lug width, strap material, length etc. of your watch.